Kassy Starr grew up in rural Arkansas, about 50 miles north of her current home in Sparkman where she lives with her husband Scotty. “We met at the Harley Davidson in Hot Springs and moved here in 2011,” Starr says. “This used to be Scotty’s grandmother’s home.” The closest Walmart or grocery store is about 30 minutes away, and the nearest gas station, five miles away, only opened a couple of years ago. The Starrs wanted to move to Sparkman to “be in the country, live the simple life,” Starr says. 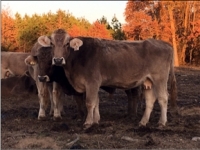 Saving money on energy efficiency upgrades makes it possible to invest in growing a cattle farm. As they look ahead to making their farm viable financially, she works at the Christian Health Center that treats patients who lack health insurance, and her husband works at Woodfield Trucking, a family business. Prioritizing investments in land and cattle was important to build for the future, but Kassy says that she and her husband also knew their home was in desperate need of upgrades as well. In the heat of summer, electric bills were up to $330 monthly, which they knew were way too high for the modest two-bedroom home, but saving for a new HVAC system was difficult given other expenses. 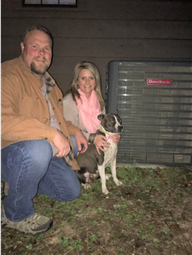 The Starrs get their electricity from a local rural electric cooperative in Arkansas called Ouachita Electric, and Kassy had heard about the cooperative’s new on-bill financing program for energy efficiency called HELP PAYS, which is based on the Pay As You Save® (PAYS®) system. Ouachita Electric provided a complete home energy audit, at no cost. The audit identified needed improvements and analyzed annual cost savings associated with each one, to determine eligibility and arrive at a set of recommended upgrades. For the Starrs, these included additional insulation, air sealing, new doors, and HVAC upgrades. After the Starrs elected to have the work done, they chose among the local HVAC contractors participating in the program. A quality assurance inspector with the program checked the work on-site, verified it was done right, and the utility paid for all costs. The Starrs are now paying Ouachita Electric’s monthly cost recovery charge right on their electric bill out of the savings produced by the efficiency upgrades. There’s no loan, no credit checks, dealing with banks, finding contractors—in short, no hassles. And the cost recovery charge stays with the meter, not the resident, so renters can participate, too. 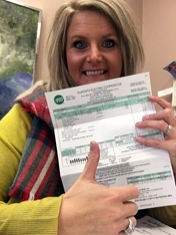 Kassy Starr is happy about a lower monthly bill and plenty of efficiency upgrades! The whole process to get started was “so easy,” Starr says, “and the next thing I know they’re calling to set up the upgrades: insulation, installing the new HVAC system, then Ouachita Electric came out to confirm it was all done correctly.” After the upgrades, Ouachita Electric ordered a final energy audit, to show the savings. The upgrades were completed in September 2016, and energy use dropped nearly 23 percent compared to the year before, even though September 2016 was hotter (and required more air conditioning power) than 2015.